I just completed a 3-day TI-Nspire training that my school contracted TI to come in and do. I haven't tried to teach with it yet, but of course, I have opinions. Let me say right off I don't necessarily think this technology is the right solution for every school, and I'm not trying to sell it to you. I'm just going to talk about what I like and don't like about it, because I know some people are curious, because they've been asking me - hopefully this will be a useful source for people making their own decisions. Implementation: My school started phasing in the TI-Nspire with last year's freshman class. New students will now be expected to purchase a TI-Nspire handheld ($150 retail) as opposed to a TI-84 ($139 retail). For families who aren't able to purchase their own, we check them out a calculator for the year like a textbook. There are two versions of Nspire: a CAS and a numerical. The students get the numerical. We have a few classroom sets of CAS to share, too. It has a non-qwerty keypad - the keys are in alpha order - this is annoying but makes it more standardized test-compliant. Functionally/mathematically, as far as I can tell, the technology doesn't do any more for you than say Wolfram Alpha plus Geogebra. It is however very sleek and every bit as good. 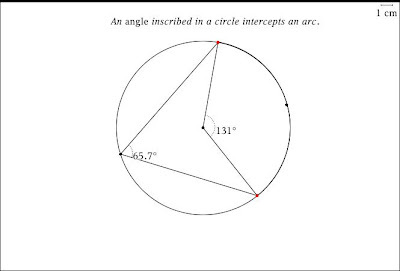 It has a learning curve, but no worse than Geogebra or Sketchpad. If you already know either of those applications, you can pretty much hit the ground running. If you go to one of these trainings (also may require a good relationship with your regional trainer-rep-salesman guy), they bring you lots of swag. As part of the workshop fee my school paid, I received: a TI-Nspire CAS handheld, a canvas case with extra pockets (for cables, I guess? 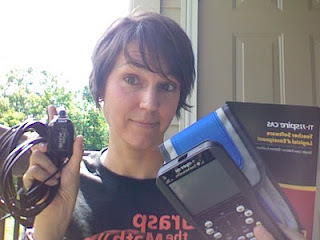 or maybe candy), a copy of the teacher edition software (emulator and connecting to your class functions), a Belkin hub and four cables for linking up and sending documents out to student handhelds, and a sweet t-shirt. This is what I see as the big trade-off: Because of the proprietary nature of the software, we're not going to experience the wide-open, awesome universal sharing and embedding we get with Geogebra. This is crappy. However, the trade-off is access - every student should have their own handheld - in their hands in class every day, in their backpack, at home with them at night. I can't say the same for Geogebra. We're not a 1:1 school and won't be any time soon (for many reasons, and cost is only one of them). Getting computers into kids' hands in class every day is rather a hassle at my school. And not every kid has a computer at home (despite my history of getting snippy about it). TI releases new software versions and hardware updates at a pace that makes Apple look downright sensitive to early adopters. This coming year in Geometry I am going to have kids with both generations of keypads, and it's going to be a nightmare. The trainers will use TI-Navigator, which is a wireless document transfer/communication between your computer and all the student handhelds. It's seriously impressive. You feel like you're on Star Wars. Or Star Trek. Or some other show with "star" in the title. You probably don't have Navigator. It's $2500. The instructional materials they make available, while plentiful, well-organized, and technically very nicely designed, are a pedagogical train wreck. Several times during the training, I heard about how a particular investigation + pre-made file required very little thought or work on the part of the teacher or student! As if this were desirable. Mostly, they have the student opening a pre-made file and dragging a point or slider around and looking for what changes or stays the same, which: 1. yawn, and 2. how is that supposed to stick in a brain? Which begs the question of how to best exploit its capabilities for learning some math better than you can without it. Which I feel is an open question wrt classroom tech in general. Off the bat I see three really nice uses. 1. Getting a handle on a problem and its constraints. 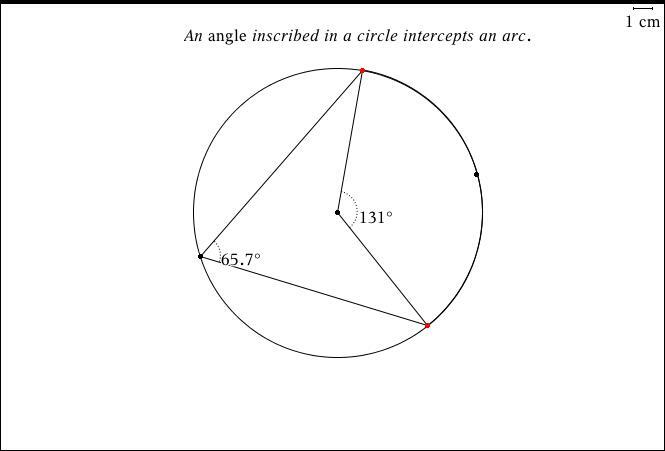 Here is a sweet little problem I just swiped from What's Math Got to Do with It? , because it happened to be laying around. 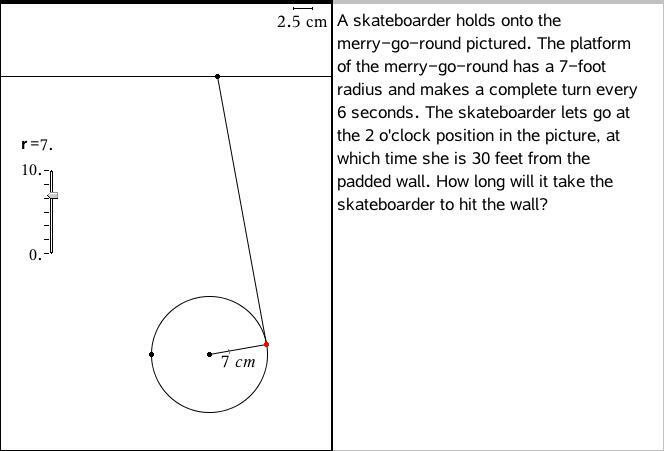 If this were not just a screenshot, you could drag the skateboarder, represented by the red point, around the merry-go-round and get a good feel for what the problem is stating and asking. 3. Dynamic Notes : A document with a page for each key concept in an instructional unit, grabbable and playwithable. No doubt people have questions... see you in the comments. For $150 they are getting pretty close to the cost of a netbook ... and that seems like it could provide far greater functionality. I'm not going to argue with you. This wasn't my decision, I just live with it. I can think of some additional not insignificant headaches that Netbooks would bring, though. Totally agree with you, Maria (and Kate), but other issues abound in high school. Such as netbooks not being allowed on the SAT or ACT and the IT nightmares that Kate hints at (at least I think she was hinting at that--maybe she was referring to kids getting on AIM and blowing off the whole thing to chat with each other). The teachers in our district seem to have a similar fascination with the Nspire as yours, Kate. "Oooh! Look, you can animate a spinning circle for the Ferris wheel!" Ok, but other than the tiny "wow factor" for the kids, it doesn't add any learning for the students (unless they don't know what a Ferris wheel is). The usefulness I see for it, possibly, is that it can start to get move towards a completely differentiated classroom. You can essentially make powerpoint-type slides for the lessons and load them up for the kids. Then, the kids can go through the topics at their own pace and you come around to assist on individual issues. That removes a lot of the group work stuff that I know we love, and even on some level is moving towards the "school could just be a bunch of videos for kids to watch" thing, but it's where it seemed like this might be headed. Dave, have you seen any "work through these slides" type individual-paced investigations that weren't pretty if not totally crappy? I'm trying to think if I have. I'm not saying it can't be done well, just that it would be hard to. No, all the ones I've seen have been really bad, too. But I could totally see an admin getting on that train. Pfff. Yeah. All a freaking board. I'm sure many of you have seen it, but enjoy! At Mathalicious, we try to make slideshow lessons that are pretty and not "totally crappy" (free, too). They're not intended for student use per se, though could probably be used that way. Almost all of the tech resources are for GSP5, which may or may not be an issue, given school budgets. Re: the general issue with materials that are too scaffolded--eg Kate's frustration with some of the TI materials--it's really hard to find that balance between constructivism and scaffolding, especially given the wide spectrum of teachers' content knowledge, experience, etc. It gets even harder with interactive materials, which is simply to say, compromise is a rough gig. Anyway, just wanted to share the site. If it ends up being helpful, great. If not, or if there's something you'd change, I'm eager for the input. (Please keep in mind that it's relatively new, so there are only a few dozen lessons up there now, with 150-200 more in the queue). I think some of the TI calculator's enduring popularity can be attributed to the fact that they *are* limited, crippled machines in an era when anything with a web browser can cause admin nearly infinite headaches. Calculators do what they say on the tin, and NO MORE. Which isn't exactly true, but it increases teacher confidence that when they look out over a class of kids staring at calculators, then they *must* be doing math. Yeah. They also represent what current math teachers expect math to look like. I was required to have an 81 when I entered HS, so at this point everyone teacher has either been teaching with these devices for 20 years, or has used them as students for as long as they remember. We're just launching a 1:1 program this year, and it's been hard to talk teachers into thinking of GeoGebra (or the like) as a replacement for the calculator. The laptop is still seen as a luxury device, while the calculator is tied to the "real world." In short, they are weird chunks of semiotic plastic. How do you work the arrow keys so they, well, work? Half the time (especially when the touchpad is activated simultaneously) I push the button and nothing happens. I usually have to push 10 times to move the cursor 5. @Karim, I'd tend to say the downfall of the ti-style guided investigations is the one-size-fits-all mentality. I do appreciate the quality of the work you're doing on mathalicious, though. @tieandjeans, agreed, but I think the appeal of the standalone calculator goes beyond teacher comfort level. People like me and most f(t) readers who are perfectly comfortable with the capabilities of what is on the web aren't scared of the unknown, but can anticipate potential headaches involved with 1:1 that we don't need to worry about with handheld calculators. For example, our school wifi slows way down on staff days when many faculty are using laptops - we'd need some serious upgrades for all the students to have access all the time. We can't just open up the Internet and all its depravity, some blocking is demanded by the community, but blocking is imperfect and we often find legit websites we want to use blocked. We can't just let the kids install whatever software they want, but if you lock down admin rights, it can be a pain to get stuff you need for class installed on anyone's machine. etc etc etc. @Jason are you using the old or the new faceplate? I found the old faceplate to be unresponsive sometimes like you describe, but the new one is a big improvement. It's $10. If you are using the new one, I have to say I don't normally try to click the middle of the touchpad to select things, I tend to press the Enter button instead. Does everyone know about TI-Smartview? I think only teachers can get it, but it's a full-screen emulator. It was a huge lifesaver when my students start asking, "What's the window," etc. It's for the TI-83/84 series; not sure about the new versions. (FYI, if you have a Mac, you have to open it with Rosetta). @tieandjeans, yes, the limitations of it are pretty good, just as reading on a Kindle is better than reading on an iPad. Still, I wonder whether they're just outdated, period. It's hard to set domains for functions. It's hard to do a lot of other non-fiction stuff. For my money, GSP5 is the best thing out there. I saw those folks present at last year's NCTM, and couldn't believe it. The learning curve is definitely there, which may nix it for most, but if you can get a handle on it, it can make for some great stuff. @Kate, I agree: one-size-fits all has all sorts of limitations. Spandex is a good technology, but not perfect. That said, perfection being the enemy of the good, and all that. We try to make them as customizable as possible, but it's tough with technologies being what they are. I don't know much about the non-CAS NSpire, but my school uses the CAS version, and has been using CAS in some of our classes for years. I think CAS has a lot of educational value, which I can expand on if people are interested. I've never used the pre-made lessons, and doubt I ever will; I don't like the idea of having the calculator "teach" for me. 1) Pretty Print, which means that the calculator displays things the same way that Math Type would. It eliminates a lot of order of operation errors that can get in the way of understanding other concepts. 2) The fact that the graphing, table, and calculator screens are linked. I like that kids can type a function on the graph screen, and then evaluate that function on the calculator screen. I think it helps make connections. Katherine, the newest OS for TI84 has "pretty print" to some degree. Also, you can evaluate functions on the calculator screen on an 84 as well (VARS > Y-VARS > Y1, then on the home screen Y1(2)). Rather interesting blog you've got here. Thanks for it. I like such topics and anything connected to this matter. I would like to read a bit more soon. Thanks for this, Kate. I attended a three day workshop on NSpire almost three years ago. I left with many of the same thoughts as you. I found the OS clunky and much harder to use than it needed to be. I created several activities, and used them once. Then I put in the TI-84 keypad and never went back. TI tells me that educators can exchange that old model for the newest model, which might change my outlook a bit. The NSpire has just been approved for our provincial exams, so I expect we will see more and more students bringing them to class, which means teachers are going to have to figure out how to use them. As someone who didn't see a graphing calculator until college and using a calculator in high school was optional (until we learned the trig functions), I've heard similar complaints before: when graphing calculators were first introduced. Now we are all used to the idiosyncrasy of those calculators and couldn't teach without them. As someone who has an Nspire (for fun) I can see the learning opportunities of its capabilities: translations and transformations of families of functions for one. But, just like all new technology, there is a learning curve. In ten years we'll be saying, "How did anyone teach without this?" Is it perfect? No. But, TI is always working to improve what they provide for us as teachers, i.e. the new OS is a vast improvement over the initial OS. And, as always, we need to keep in mind what is allowed on standardized testing. I would hate to teach a student how to do something on a computer and then they get to the ACT and think, "If only I had my computer I would so know the answer to this question!"